The lazy days of summer are just about over, so I thought a shaker card with real sand from Clearwater Beach, Florida might be a fun card to send someone in the north, to remind them of their vacation memories. I really love how the frame turned out with the shimmer and texture....will be making a picture frame with this technique. Step 1. Cut Kraft card stock to 4.25 x 5.5 inches. Use Scor-bug tool 1/4 inch from the edges, then distress edges. Ink with Memento Rich Cocoa. Step 2. Die cut frame from Kraft cardstock. 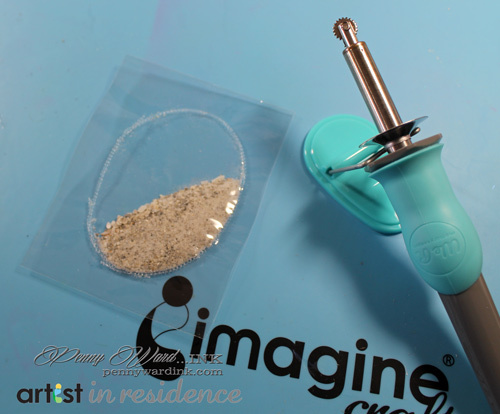 Add a Nickel size dollop of Creative Medium Shimmer to craft mat. Add 6 drops of StazOn Studio Glaze Ganache, mix together with palette knife and adhere around frame. Let dry. Step 3. 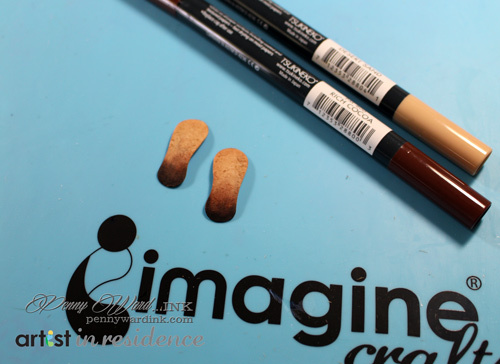 Make shaker from a page protector using the Fuse tool. Add sand and Fuse the opening. Trim shaker to slightly smaller than frame. Step 4. After frame is dry, adhere a clear piece of acetate to backside. To front of acetate, stamp sentiment using StazOn Cotton White. Step 5. Adhere shaker to card front. Adhere frame over shaker using foam adhesive. Wrap twine and make a bow. Step 6. 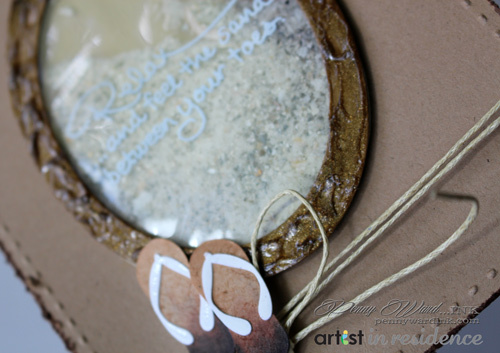 Die cut flip flops and color with Memento markers Desert Sand and Rich Cocoa for an ombre effect. Add straps and apply irRESISTible Pico Wedding Dress, let dry. Step 7. Adhere Flip Flops over bow with favorite adhesive. Attach the card front to a card base of white cardstock that has been trimmed to 4.25 x 11 inches and folded in half.